Marilee earned a Bachelor of Science in Aeronautical Engineering in 1949. 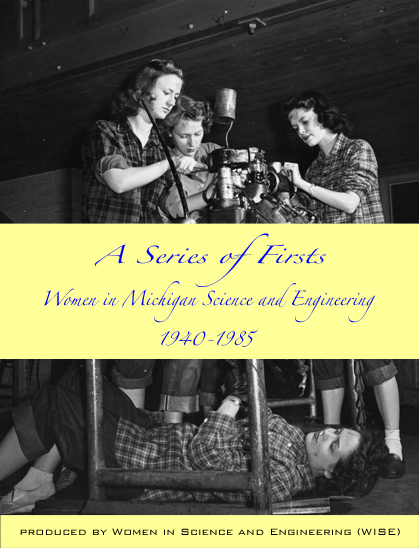 After working at the University of Michigan Aeronautical Research Laboratories at Willow Run for several years, she devoted herself to raising her four children and volunteer work. Listen to Marilee describe her family and their jobs during the Great Depression. KW: Well, I guess to get started, can you tell me a little bit about your childhood? What was your family like growing up? MK: Well, when I grew up, when I was four the Depression...the banks closed. And so it was a hard time for people but a good time. My family was very loving. I was the oldest child and born in ‘26. And then my sister was born four years later and that was right when the banks failed. But I thought, “Boy we are the luckiest family in the world because we got a new sister and a radio." Radios were new then. And what was the other thing? MK: And a car too. We got a car too. KW: So all of this was during the time of the Depression? MK: Oh yeah. And actually the Depression was in effect and people were living differently than they had before, through most of my childhood. Now, a lot of the fathers didn’t have jobs or didn't have steady jobs. My father had two jobs so I am sort of surmising that we were better off than a lot of my friends because he had two jobs whereas a lot of fathers didn’t have any jobs. But I never...looking back on it, as I think these things...I never thought there was any difference in our lives, my friends and I.
MK: Yes. They were both alike. He was a machine tool designer and a good one, so if anyone was wanted he would be wanted. And that’s what he did. KW: You said you had one sister. Did you have any other siblings? MK: No, no just the two of us. KW: Was your mother a stay-at-home mother or did she work? MK: Oh very definitely she was a stay-at-home mother. She had been a secretary until I was born or I suppose until she became pregnant. I don’t think in those days she would have been kept on. Yeah she was a stay-at-home mom; a loving, wonderful mother. MK: No, I didn’t know anything about it, the Depression. We did have one friend that...she was just thirteen days younger than I...and she would have been I suppose what you’d call best friend but we were too young to think of it that way. And they lived in a house that was foreclosed and they got another house out in Farmington, we were in Detroit, Redford, so it was several miles difference that they moved. But they got it cheaper than what they owed on the house they lost. And a bigger house with a nicer yard and so housing was really strange, different. Not what we think of as the way housing markets were. Listen to Marilee talk about her favorite activities and subjects that led to her interest in engineering. KW: So, I was going to ask you, when did you become interested in science...was there a time at an early age? MK: No, no. My parents exposed us to all kinds of experiences and I never, at least when I was younger, thought of any of it as being science or being engineering, it was just things, the way things are that you like and enjoy (laughs). And I don’t know that I knew my dad was an engineer. When I was fourteen we moved from the little house that I lived in all my life up until then and we moved just a mile and a half, still went to the same school. And I sort of find myself when I’m thinking about answers to my childhood until I was fourteen and then my teenage years when I was in high school was from the other house so I’m looking at it from two different directions. And then it was really only four years in that house until I was really more connected to U of M than home. KW: What were some favorite pastimes or things you liked to do when you were growing up at either of the houses? MK: Well, bike riding. We used to go to the woods, similar to this woods (gestures to backyard) but just out in somebody’s back forty or something that didn’t mind. We’d go in and dig up the wildflowers and take them home and we had wildflower gardens. We also used to collect caterpillars and raise them until they spun whatever they did. And we had them hatch and lay eggs. And that was just for fun. I didn’t think of it as being science or engineering or anything. Reading, a lot of reading. Went swimming and we had a canoe so we played with the canoe. And then later on, sailing. We had a sailboat. KW: In your schooling prior to U of M, you know elementary through high school, was there any class overall that you really enjoyed or subjects that you really enjoyed studying while growing up? MK: Oh yes. In elementary school I liked nature study, we called it. And the auditorium put on plays and did a lot with poetry. We had a special, it wasn’t a class...well maybe she did it with the class...verse speaking choir, it was called, and we all stood up together and the teacher waved her arm and kept us together: "John had great big waterproof boots on. John had a great big waterproof hat.” And I have friends that I still keep in touch with, they’re going, but we could stand up together a few years ago and still sing those. So that was fun. And then when I got into high school I wanted to take all the math classes and all the biology and chemistry and physics. They were just interesting to me because they were problems and not memorizing. And French...oh no. KW: I can agree with you on that one. I took French as well. Listen to Marilee discuss enrolling in U of M and her first impressions of Ann Arbor. KW: Well, what made you decide to attend University of Michigan? MK: I haven’t any idea. I don’t know if I knew there was another college (laughs). We didn’t take any tests to get in. I don’t remember applying. I don’t remember worrying if I'd get in. I just, "Well, now I’m finished at high school (Redford High) now, next fall I’m just going to go to Ann Arbor. Where is Ann Arbor? What is Ann Arbor like?" I didn’t know. I just...that was the next thing in line for me. Very different than today’s kids. I’d never been in Ann Arbor until I went up to orientation. KW: What were your first impressions of Ann Arbor? Do you remember? MK: No, it just looked different. The big fraternity house that’s on the corner of Hill and Washtenaw with...well it used to have gates...it looked rather foreboding or forbidding or something. The next question I see here is living arrangements. Listen to Marilee and her husband describe how she lived in a vacant fraternity house. MK: The next question I see here is living arrangements? KW: Yeah I was going to ask you if you can recall where you lived on campus. MK: Yes. I lived back if you would go to that same fraternity house that‘s on...if you would go across the street, across Washtenaw, and take Hill one more little block. There’s a fraternity house there and that‘s where I lived. KW: Was it an apartment, a sorority, what sort of arrangement was it? MK: It was a U of M dormitory. LK: During World War II the University took over a bunch of fraternity houses and used them for dorms. They were just girls, no boys. MK: Yeah we had a house mother. So, maybe it was a little like a sorority except none of us knew each other ahead of time. That’s where I lived that first year. I don’t remember what fraternity it was...it wasn’t Sigma Nu I don’t think. KW: Did you make any friends with the girls there? MK: Oh yes. I did. Only one of them that I still have any contact with. There was one that lived here in Ann Arbor but she...we weren’t close friends. She has died. KW: What were they studying? MK: Oh different things. The one that I still am in touch with, she was studying geology. And my best friend at that time in this so-called dorm was a girl from Saginaw whose parents are from Russia; she’s a wonderful, happy friend. We were supposed to sleep upstairs in an unheated dormitory room. I guess maybe that’s the way fraternities do it anyway. And then we had a study room that there were four of us in. And Naida and I were the only ones that kept through the winter sleeping upstairs in that unheated dormitory room. KW: Wow that‘s impressive, especially in Michigan winters. MK: Yeah. So the two of us tucked in, it was cold up there (laughs). Listen to Marilee talk about campus life including the story of how she became the first woman admitted to the sailing club. KW: What kind of things did you like to do on weekends or when you had days off? MK: Well, I thought of that and I don’t know. When it was good weather, or didn’t even have to be good weather, we’d go to the Arb walking or tobogganing. Studying, I guess, a lot. KW: That’s the answer I’ve heard most of all: “We didn't have time off; we just studied." MK: Yeah and we just lived. My parents lived in old Redford and that wasn’t too bad a drive but I didn't go very often home. No, I couldn’t think much what I did except study (laughs). MK: No, actually. I did not start out as an engineer anyway. My freshman year I was just in lit. school and then I transferred when I came back as a sophomore. And no, I didn’t have many men friends. I had a small number of women friends, girl friends. Again, I guess, we were studying and there wasn’t time to just be friends. KW: Did you continue to live in a dorm-type situation? MK: Yes, all the way through. When I came back as sophomore we lived out on Geddes right overlooking the Arboretum and my bed in that dorm...it was a different kind of a fraternity, it wasn’t a Greek fraternity...but the house was set up the same way. We had a house mother and study rooms were two of us in the study room and then the four of us were in a sleeping room. And my bed was the upper bunk right over the Arboretum. It was a fine bed (laughs). And I shared that room with my friend whose parents were Russian, Nadia. And the other study room was the one that I’m still in touch with. But I didn’t make a lot of friends. Even in the same house. We were friendly but didn’t have time to get too deep into it. KW: I was going to ask you about any clubs or organizations you were involved with and I saw on the survey we had sent out that you were one of the first women to join the sailing team or club? MK: Yes, yes it was the sailing club, sailing team. Yes, I was one of the first. KW: Can you tell me what that was like? Was that a childhood interest? MK: Yes, yes we sailed. But some of the people that were in the sail club were from the East and had really sailed competitively and whatnot. I had never done any of that, just sailed for the fun of it. In the club I did learn to try to be competitive (laughs). It was just a shock to me when I went. I guess they had announcements that there was going to be the meeting to organize for the fall and I went and they said "well actually we don’t allow...we don’t have any women in this club" and l suppose I sounded off. I just couldn’t believe that they could have a sailing club and that they wouldn’t let women in (laughs). Well, they said they were thinking about it and I did get in and there was one other girl, Jeanie, she was just about engaged to one of the real big guys in the club and so she got in and maybe they let me in to have an excuse for her (laughs). Anyway, yes, that was really the only thing I joined while I was a student. Listen to Marilee discuss how she felt about the Michigan Union having a separate door for women and where she liked to eat in Ann Arbor. KW: How did you feel about the Michigan Union having a separate door for women? MK: Why not? It’s their building! It didn’t ever strike me as to think that there was something wrong with that. We could get in, you could go in the side door. And why do you want to go up all those stairs and go in the front door. That never bothered me, I never thought about it. KW: Did you ever use the Women’s League at all? MK: No. We ate there sometimes. Oh that's one thing about these dorms; they didn’t have food services. KW: Oh really? So where would you eat? MK: Well. I can hardly remember that freshman year (laughs). The sophomore year there was a fraternity across the street that did have food service and we could go to that one. I don’t know where...we just walked into town and ate...oh what was that one that was on South University that was so popular? Lots of people ate there. I can’t remember. And ate at Metzgers on Sunday night and there was a place if you go through the tunnel from State to...Nickel’s Arcade. If you go through Nickel’s Arcade then there was some buildings not straight across but just a little bit to the right and in there they had a cafeteria. It didn’t belong to the University, it was privately run. But it was small and steamy (laughs). The windows would all steam up and there’d be all these people in there and you could get a card for $10 with $13 worth of food on it. And mostly we ate there. And that’s where I learned to eat liver. I’d never eaten liver and one night there was nothing that I liked, nothing there that I would consider eating and I thought "well, I have to eat something and I know liver is good for me so...”, so that’s when l learned to eat liver (laughs). Listen to Marilee and her husband discuss the bands that used to play at the Michigan Union, the ban on student cars, and the games they liked to attend. KW: I guess looking back overall are there any memorable events from around campus or in Ann Arbor that stick out at you? MK: No, I don’t really remember anything. We used to have dances at night though, I hadn’t thought of that. Every night, I think every Friday and Saturday, in fact. Every weekend, anyway, there were dances at the Union, in the ballroom of the Union. Then there were the Senior Prom and the Junior Prom and they would be down at the...something down by where the field houses are now. There was a big building and they would have name bands, big name bands, sometimes even two of them. MK: Yeah Tommy Dorsey. Who else? Do you remember any others? LK: Tommy Dorsey, Glenn Miller. MK: Did Glenn Miller come? I didn’t remember him coming. LK: Oh I don’t know who came here. MK: Oh. Well, that’s what we’re talking about, who came here. Yeah if somebody else mentioned Tommy Dorsey I expect he was here. But yeah they had big name bands would come, not every Friday and Saturday but somebody came, I suppose locals. And dancing, that was the big thing when we had a little bit of time. And, you know there were no cars. Students couldn’t have cars. KW: Did you bring a bike? Did people ride bikes a lot? MK: Well, they did, but they generally got stolen before the semester was over. I’m trying to think...somebody borrowed mine...I mean I told her she could borrow it but it didn’t get locked and it didn’t get back to me. But we used taxis and you could generally get two couples into a taxi and it didn’t seem to be too expensive. In those days there wasn't as much sharing and going Dutch: the guys paid. They bought the tickets to the dance and they paid the taxis, so it was nice to be a woman (laughs). KW: Did you go to any U of M football games? MK: Yes. Went to the football games, always. There were real cheap tickets, wouldn’t think of not going or selling the tickets. We went to those games. In fact...and I used to go to the hockey games. Never went to the basketball games. Went to the baseball games, football games, and hockey games. Yeah I had forgotten about that. That would be something other than studying. And U of M had good teams then. There was one year when they won the Big Ten title in all three of those and basketball. But I didn’t go to basketball. Boy, that was a great year. Listen to Marilee describe the impact World War II and its end had on her experience at U of M.
KW: Well, the next set of questions really talk about campus life during the war but you would have been there right after World War II correct? MK: Well, actually it was still on when I was a freshman. There just weren't many men on campus and that’s why all those fraternity houses were available for women’s dorms. So, there were a lot more women than they had had up until then and less men. The men that were there, well, there were a bunch of them that were just regular men students but not a lot of them. And then there were some brigades or bands or I don’t know what they would call them of NROTC, Naval ROTC. And I don’t know that I ever even met one of those guys. KW: Do you remember what the mood was like on campus when the war was over? MK: Yeah, that was the one in Europe. That was in the summer so I think that would have been between my freshman and my sophomore year. So, the celebrating wasn’t on campus. We came back and were still in the men’s dorms. And then the armistice with the Japanese, there was more celebration then. Listen to Marilee and her husband talk about her interactions with her male classmates and professors. KW: Well, next I want to ask you a couple of questions about some of your classes. How did males treat you? Were you one of few women in your engineering classes? MK: I never had a class that had another woman in it. KW: What was that like? MK: I don’t know. I like men. I always got along with them. I never had any fights. KW: Your male classmates treated you pretty fairly? MK: Yeah. Not very interested but...we were all too busy studying and focused with our own problems I guess. KW: What about any professors, either memorable or really influential professors? You had mentioned one on your survey, a professor who told you that you shouldn’t take his class because he wouldn’t pass you. MK: That’s right, there was that one. KW: What was that like? Did he just say that to your face? MK: Yeah. You know I don’t even remember it, he remembers it (gestures to husband). KW: Were you there when that happened? LK: I was there but I wasn’t in that particular class. There were two sections of it, it was Aero 114, and she was in one section and I was in the other and the one she was in, the professor, who was the head of the department, called her up to the...she told me about this at the time...he called her at the end of the first lecture. He says “Miss Diamond I want to talk to you after class," and he told her that girls shouldn’t be in engineering and she would not be able to pass the course and should drop it. So she did but she needed that course and there was this other section taught by another professor who was the coauthor of the text and that’s one of the first times I saw her. She showed up the next day. MK: No, they just didn’t pay any attention to any of us I don't think. Just you’d hand in your work or your tests or whatever it was. There was one...it was a senior project or something...we had to design an airplane and I was having a lot of trouble with that. All these guys that were in that class designing this airplane, they’d all been in the air force and had been flying and knew just what was wrong with those planes and what they’d do to make them...I’d never been in a plane in my life! I don’t know how I chose aeronautical engineering. I didn’t have any idea of where to start, where to go, how to do anything. LK: But you had that aviation class in high school. LK: I thought that’s what got you interested in it. KW: You were talking about trying to design one for your class. MK: Yeah and it was very very hard for me. And I tried to talk to the professor and he said, "Well, you know, should have thought about that; you just don’t know enough to be taking this course.” (laughs). But he didn’t say it was impossible or anything and he did pass me. LK: Who was that, Nelson? Listen to Marilee discuss her favorite classes at U of M.
KW: Did you have any particularly memorable classes? Classes that you maybe loved or classes that you hated? MK: Well, I liked the metallurgy classes and I liked the shop class that we had where we got on big machines. And he came to pick me up after one time at the shop class and I was climbing on a great big machine setting dials and whatnot and he thought that was something that that professor or instructor or whatever had made me work on that big machine. But I liked it. My favorite class I guess I would have to say was taught by Professor Van der Brock and it was called Limit Design and there’s this book there (shows the book) and it was Applied Mechanics, I think, is what it was. But he taught differently than any of the other professors that were teaching that class. It was a class that everyone had to take but he had a different theory, the theory of limit design and he taught and it was structures. And that was so fun because he did it differently and it was like back in high school when we had problems that you could solve and you wanted to do it better than the boys. There was a bunch of guys that were maybe still trying to get over the war or something. They weren’t very involved in that class or something, it didn’t seem to me. But the Professor Van der Brock would stand up and talk and then he’d ask a question and all those guys sitting there doing nothing and up I’d stand and say, “Well, Professor Van der Brock, what about this?" and that’s what he wanted. He wanted a Socrates-type thing, the Socratic Method. And he would ask questions and nobody would answer and so I’d answer. So it was fun and he really appreciated it. And then later on when I wasn't taking a class from him I did some grading for him, checking homework. So, he was my only friend that was a professor. So, I enjoyed some of the classes and some of them I didn’t (laughs). KW: It was kind of a mixed bag. Listen to Marilee and her husband talk about and show off their slide rules, a commonplace item when they were students. MK: You’re skipping one question here, way back. It says, "Tell me about anything that would currently seem unusual but was commonplace at the time." KW: Did you have something that you had thought of for that? MK: Yes, slide rules. Everybody had one. LK: I bet you don’t know what it is. KW: It was the older version of our calculators today. MK: It’s what we used instead, yeah. LK: I’ve got a collection of about a dozen or more of them. MK: But every engineer had a slide rule. And they were kind of expensive then. LK: They cost about fifty bucks. MK: To learn to use it? No. Some people had a class where they’d learn to use their slide rule better. There were possibilities on my slide rule that I never learned to use but we sure did use them. KW: Do you think that kids today are so spoiled with those fancy graphing calculators? MK: Oh yeah, sure. They wouldn’t even see any similarity I guess. LK: You couldn’t get through school without a slide rule. This was mine which I bought new. This was hers that she bought used. KW: I trust you to show me how to use this. I don’t want to break it or anything. Oh wow, that’s amazing. MK: And you just slide it this way and that way. LK: See it has all these scales on it and you’d line up the scales and it could multiply and divide and do trigonometry and logarithms and everything. KW: That’s amazing. Wow $50, $25 would be a lot of money back then. LK: I’m sure they're not even made anymore. Listen to Marilee recount why language courses caused her to switch from chemistry to engineering. LK: And I think you told me that one of the reasons that you changed from lit. school to engineering was that you didn't like foreign language. MK: That was the reason. I was in lit. school and I couldn’t...I didn’t take the French when I was in high school because that would have ruined my grade point average (laughs). And so then I was going into a scientific...I thought when I went into lit. school that I would take chemistry. Well, I had to have a language anyway, whether I was going scientific or not. At U of M you had to have a language. And I look German and it was like a foreign language to me (laughs). I couldn’t learn it and I thought, "What am I going to do?" But engineering school you didn’t have to have a language. Didn’t have to have a language so there it was, it was my savior to switch to engineering (laughs). Little did I know I’d have to take calculus (laughs). That's how I happened to go into engineering. LK: And I'm glad that happened because if that hadn’t happened I probably would have never met her. MK: Nope, I don't think so. KW: It’s funny the little coincidences that really shape what happens. Listen to Marilee and her husband tell the story of how they acquired a boat for their ceiling that was used in the West Engineering testing tank. MK: Some people wonder why we have a boat hanging on our ceiling. Well, when he was in Naval Architecture he worked in the tank. Do you know about the tank? KW: Is it like a testing tank? MK: Yes, a testing tank. LK: It’s in the basement of the West Engineering building. MK: Used to be West Engine but I think they even changed its name. The Arch? MK: It’s all moved up to North Campus. Well, the one thing they couldn’t move is the tow tank. It’s too big and too expensive. It’s in the basement of the then West Engineering and some of the students would work in that to get some money. And finally the carpentry shop got so full of left-behind models that they let all the professors take the models home if they wanted them. Then the ones that were left the kids that had been working there could choose one, so he chose that one. It’s a half...it’s a model...it’s not up to size, but it’s one half of a catamaran. KW: Oh ok, that’s cool. LK: It was never built but it was supposed to have been an ocean going oil tanker. LK: It has two hulls, do you know what a catamaran is? So, it was a model they used for testing. MK: So, he brought it home and put it on the living room floor. And then our CPA, she was a kayaker, so she brought home her kayak and put it on the living room floor. And he thought we needed some sort of an easier to use kind of a canoe so he bought a fold boat and put it on the living room floor. LK: Well, we only had one sofa. MK: That’s right we only had one sofa. So, for a few months we lived with three boats on the living room floor. And finally we got that one off the floor and she took her kayak and we moved the fold boat somewhere else. We live kind of a cluttered life. KW: Yeah, I wouldn’t call it cluttered. I would say surrounded by memories. 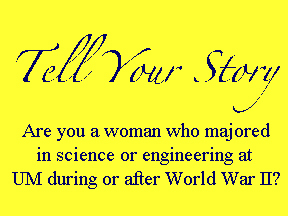 Listen to Marilee and her husband tell the story of how they met at the Aeronautical Research Labs at Willow Run. KW: So, the two of you met in class? You met during college right? MK: Yes, yes. We met at the University of Michigan Aeronautical Research Laboratories at Willow Run. KW: Were you working there during your undergraduate years? MK: Yes, yes. I was running out of money, my parents were running out of money and there was an ad for somebody to work out there and I applied and they decided they needed some women around so they hired me (laughs). So that, I would say, was the opposite of being ostracized. I was accepted. So, I started working out there and he was working too. I don’t think we’ve ever quite figured it out which of us started the first. But he was working on the drafting board right in from of my Merchant office machine and we argued about sailing. KW: Do you sail as well? MK: He never really became a sailor. LK: Yeah after I met her. KW: So, the two of you met while working together during undergrad. When did you get married, after college or during? LK: We got married in December of ‘49 and graduated in January of ’49 so it was about a year later. MK: So, we worked, continued after graduation to work at the Aero Labs at Willow Run. KW: And then did you decide to have a family? KW: Let me know if I'm skipping over anything that you had made comments on. MK: Right. I was thinking there was something else I was going to talk about. LK: Well, one thing I remember that I guess you kind of touched on it. As I remember it there were four women in the whole college of engineering at the time. Four. And we met and she was the only cute one (laughs). MK: He doesn’t know that. LK: You mentioned Mildred Deneeke. She was one of them and another one of them was a girl named Greene and never married and we saw her next time at a twenty-fifth reunion at the U of M Aero Department. 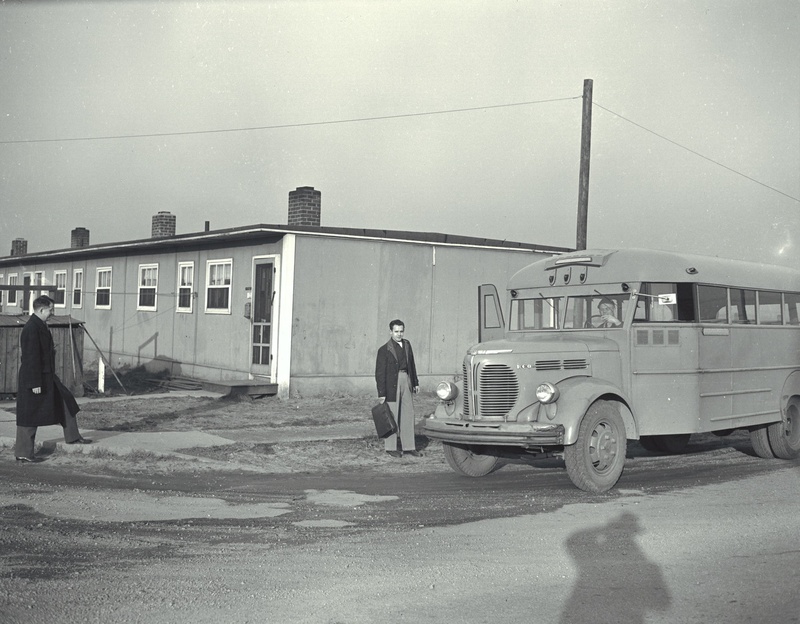 At Willow Run is where we met Fran Jenkins. MK: I knew her in the dorm. LK: Oh you did? Well I met her at Willow Run and she married Mike Holter who was a friend of ours who also worked at Willow Run. Mike died early. MK: Yeah, there was quite a bit, a lot of friendliness with that bunch of people that worked out there. We had a lot of friends. Listen to Marilee and her husband describe their careers and those of their children. KW: Well, yeah, I wanted to ask you how many years after you graduated did the two of you work at Willow Run before starting a family? MK: Well, I worked for what? LK: Well, our first kid was born in March of ’51 and she worked into February. She was about six weeks before our boy was born. And I worked there until April of ‘54. But she quit in February of ’51. MK: That was planned, didn’t ever mean to keep on working after having a family. Intended to be a stay-at-home mother. That’s what mothers were in those days. Mostly. I knew very few people that kept on working. Mildred didn’t marry and Frannie didn’t marry until after she had been working and well established in our field. KW: You had four children, correct? MK: Had four children, yes. KW: What do they do now, are any of them...and you worked as an engineer, just to get my bearings. Did you continue to work? What was your job, what did you continue doing? LK: When I worked at Willow Run, I was an aerodynamicist. In 1954 I went to General Motors and worked as an engineer and engineering manager at General Motors Proving Ground for 28 years. Then I was at the Tech Center until 1987 when I retired. I was fired for age. KW: Actually, a woman I interviewed, she was talking about discrimination and she said now it’s not really about gender; it’s about age. She said, "There were times when I was told I was too old. No one wanted to hire me even though I had a lot of experience. They wanted younger college graduates,” so it’s interesting that you say that. MK: Yeah. Well, of course, that was General Motors; they just do that to everybody. KW: So, you had four children? MK: Four kids. I wouldn’t say any of them are engineers. LK: Ted is an engineer. MK: Yeah he is, that’s right. LK: And Lon knows more than most engineers. MK: One girl tried to be an actress. LK: All four of our kids went to U of M.
MK: Took Naval Architecture and he works now for Lockheed. Something with satellites, we think. And the other boy graduated from Natural Resources and he has worked in Alaska for most of all his working career and is now...oh I don't know what you'd call it but he’s connected with and working with the petroleum. LK: He’s field manager of NPRA which means National Petroleum Reserve Alaska and has a group report to him that are responsible for...I don’t know it’s like eight million square miles or something of ice west of Prudhoe Bay. They call it NPRA Petroleum but it’s not been developed. They’re trying to be very careful about that. There are no oil wells there now just a bunch of Eskimos, not very many of them. Listen to Marilee’s husband discuss how having an engineer for a wife helped him solve problems. LK: I always felt very privileged to have a wife who was also an engineer because I worked as an engineer all my life, until I was sixty five, and I could come home with some question and some problem I was trying to work on and I could talk to her about it and she would understand what I was saying and she would look at it from a woman’s point of view, which is different, and she would come up with answers and say “well maybe it’s like this" and so forth and so it was very helpful to me. And I mentioned that more than once to people I was working with. Nobody else that I knew had a wife like that. They were nurses or school teachers but not engineers. KW: That’s interesting. I hadn’t really thought about that from your perspective. LK: It really helped me quite a lot. Listen to Marilee’s advice for young women engineers. MK: I thought I saw something here that we skipped over. Well, it said, “What sort of advice would you offer women in the field?” Do your thing (laughs). Just don’t worry about the fact that you’re a woman, just do it.